Syracuse-based Benchmark Media Systems, Inc. has earned respect within the recording community as a manufacturer of high-quality, yet reasonably priced pro audio devices, including microphone preamplifiers, distribution amplifiers, headphone reference amplifiers and AD/DA converters. Benchmark established its reputation by repeatedly emphasizing through its products a focus on quality (and appropriate) component specification, strict design tolerances and demonstrative sonic results. A casual survey of the company’s past and current product offerings also indicates a parallel emphasis on eschewing bells, whistles, everything-plus-the-kitchen-sink functionality and capricious trend-following. By all appearances the new Benchmark PRE420 ($2,775) multi-channel preamp, mixer and monitoring system seems to tack counter to the company’s traditional singular-and-streamlined product bearing. In this review we’ll see what happens when Benchmark’s straightforward approach to product design takes on some bells and whistles. 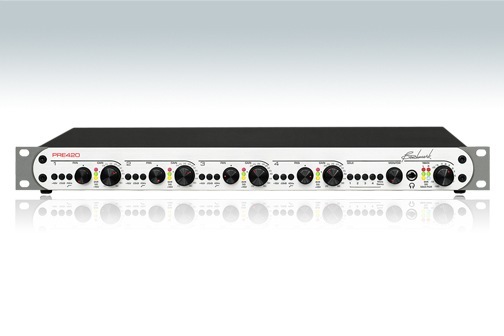 The PRE420 is a single-space rackmount device housing four channels of the latest iteration of Benchmark’s signature MP-4 ultra-wideband transformerless microphone preamplifier. Direct preamp outputs plus integrated stereo master and monitor mix outputs make the PRE420 suitable for a variety of recording and broadcast applications. Each input channel on the PRE420 can accept balanced line- or microphone-level signals via its XLR-F input jack. Per-channel controls are provided to engage +48 V phantom power, a 20 dB pad and a 40 Hz high-pass filter; separate LEDs indicate an output overload warning at a user-selectable level (red), signal presence (green, variable intensity) and phantom power engaged (yellow). A 41-detent potentiometer adjusts each MPS-series preamp’s gain across a 40 dB range, yielding +22 dB to +60 dB without the pad and +2 dB to +40 dB with pad engaged, for a maximum input level of +27 dBu and +7 dBu, respectively. Each preamp supports a maximum output level of +29.5 dBu; a balanced (XLR-M) direct output is provided for each channel. The PRE420’s integrated stereo mix bus can provide up to 6 dB of additional gain at the balanced (XLR-M) master and monitoring outputs. In addition to its own balanced outputs on the rear panel, the monitoring section of the PRE420 features a front-panel headphone output and per-channel solo switches with mono and stereo solo modes. The PRE420’s internal power supply features a core-banded toroidal transformer in a shielded enclosure, and is capable of handling any international voltage standard with comfortable over- and under-voltage margins. The unit’s rear-panel IEC power receptacle also houses a replaceable fuse and recessed mains power switch. Despite my intimation at the beginning of this article, the PRE420 is not the company’s first foray into packaging its preamps into a rackmount multichannel mixer with value-added features. In fact, the PRE420 is actually an update of a discontinued four-channel preamp/mixer/monitor called the MPS-420 (a summing-enhanced version of the four-channel preamps-only MPS-400). So what reason could I possibly have to intentionally mislead PAR’s faithful and trusting readers? Having used the MPS-420 on several occasions, and the PRE420 extensively for this review, I have concluded that the improvements in integration and implementation in the PRE420 are so sweeping that one could successfully argue the MPS-420 didn’t really count. MPS-420 fans should not take offense – it was a great, natural thing that Benchmark combined its preamps with stereo summing and a headphone monitor amplifier. But the result was exactly what one might expect from a company that excelled at singular and modular system designs and wanted to try the logical step of affordably packaging them. While the sound quality of the MPS-420’s preamps was excellent — and its Spartan integrated mixer (no soloing, fixed panning, no separate balanced monitor outputs) added nearly zero noise when compared to a direct output — it lacked the features and imagination that make such integration truly useful for broader applications. It felt like a box with four Benchmark MP-4 preamp modules, a DOM-3 differential mixer module and a HPA-1 headphone amplifier module — which, in fact, it was, more or less. I am pleased to report that the PRE420 is a thing of beauty in the integration department, and despite the number of added features and additional inline circuitry, the preamps sound even better than I remember and the mixer path is as clean as one could ever hope. Benchmark got the small details and the big picture right on the PRE420. Getting four of the finest preamps is worth the price of admission, and you get to take home the mix and monitoring top prizes. For studio recording, I typically used the PRE420 in its most rudimentary mode: up to four discrete super clean mic preamps to individual recording tracks. During most of the studio testing, I also routed the stereo outputs to recording tracks for analog/digital summing comparisons, and to have the option in the off chance that I wouldn’t be tempted to go in and do some processing or rebalancing during the mix (not bloody likely, Gov). Even if I didn’t use the mixer path for studio recording, I did enjoy the benefits of the high-quality stereo bus/monitor path for easy sub-monitoring of the sources going into the Benchmark – very handy for quickly checking stereo mic placement and mono compatibility. Any or all the inputs can be monitored independent of the main stereo mix, in either mono (a pre-pan tap) or “in-place” stereo (post-pan) modes. The PRE420 mixer section and superb RF-rejection characteristics — thanks to Benchmark’s trademark CMR1 common-mode RF choke circuit and direct-to-chassis bonding of all I/O jacks (pin 1 and shell; all audio connectors are Neutrik gold-pin XLRs) — proved their worth when using PRE420 in broadcast applications at the National Press Club and in a few ad hoc control room situations out in the world. Proximity to myriad potential interference sources and long cable runs posed no problems for the PRE420. The clean, logical layout of the front panel controls belies the PRE420’s real power, which truly resides within the internal components and integration of the system. For instance, the PRE420 is endowed with a good number of features that are not immediately apparent, but that make their valuable presence known with use. These include “simple” touches such as the input and output signal-presence LEDs that vary with signal intensity (from –8 to +24 dBu) and the internally adjustable peak warning LED (detects and sustains even extremely short transients typically ignored by common “clip indicators”), Additionally, there are features that fall into the “beyond the call of duty” (yet very appreciated!) department, such as phantom power “hot-plug” and short-to-ground input protection – two things for which I thankfully did not have occasion need – and the top-notch 0-ohm HPA-2 headphone amplifier (its own design marvel) plus its associated rear-panel mode switch that allows the monitor XLR outputs to be automatically muted upon headphone insertion. Taking the superb sonic quality and thoughtful feature set as givens, I do have a few nits to pick with the PRE420, several of which are carry-overs from its prior incarnation. The first is really a wish-list item: I would like the ability to extricate a single preamp from the stereo mix, so it may be used independently of a X/Y-plus-detail mic set-up or other three-source mix (only one preamp channel needs to have this ability, which shouldn’t pose any threat to sonic integrity). (According to the manufacturer, this can be achieved by using the monitor bus as the X/Y-plus-detail mix [the three solo’d together in stereo]. —Ed.). Also on my wish list is the ability to add additional channels/PRE420s into the main mix bus. Earlier in this review I used the term “ultra-wideband” when referring to the MPS series preamps found in the Benchmark PRE420. To be more specific, the preamps in the PRE420 are virtually linear across an astounding 500 kHz bandwidth, eliminating the detrimental masking and unpleasant audible artifacts caused by HF intermodular distortion “fold down.” This is but one of the many design accomplishments that place the PRE420’s direct and mix outputs among, if not the, clearest and quietest signal paths I’ve had the pleasure of using. From its sonic quality and thoughtful feature set through its technical integration and design gestalt, Benchmark can be very proud of the PRE420.